Earth’s magnetic field has long been the object of intense research by scientists as it is one of the major reasons that Earth is habitable, acting as a shield between Earth and damaging solar radiation and the toxic particles that come with it. The field is the result of a combination of factors interacting deep under the Earth’s surface, where an outer core composed of liquid iron alloy surrounds the solid iron inner core. 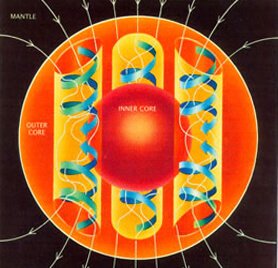 This liquid outer core is in constant motion due to convection, which is the result of heat movement and the thermal conductivity of the iron itself (Figure 1). This convection creates what scientists term the ‘geodynamo’, which is responsible for Earth’s magnetic field. Although researchers have been able to determine how the field is produced, they have been unable to come to a consensus on how old and how exactly the conditions that enabled its creation came about. Research in this field is limited by the simple fact that we cannot actually sample the true conditions in the core, and instead must rely on studying seismic waves, laboratory simulations, and computer models to learn what we can. Last week an incredibly interesting paper was published in Nature by a group from DESY Phonon Science in Germany, outlining groundbreaking research on the thermal conductivity of the Earth’s core. The researchers used a laser heated diamond anvil cell to create conditions similar to those that exist in the center of the Earth in their lab. In doing this, they hoped to test the thermal conductivity of iron when it is exposed to the high temperatures and pressures at the Earth’s core. Thermal conductivity is a crucial factor in the creation of the magnetic field, as the heat that drives the convection is produced by the thermal relationship between the inner and outer core. The heat production is the result of particles of iron present in the liquid outer core cooling and ‘freezing’ to the inner core, a phase change which gives off heat. 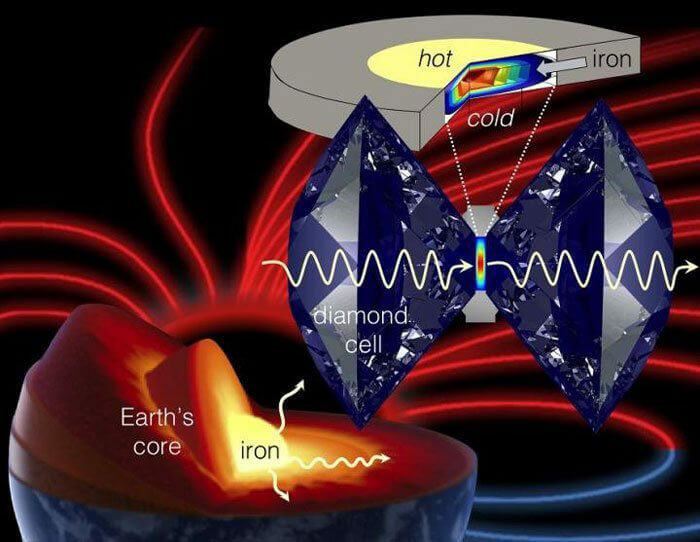 The team proposed that by quantifying the thermal conductivity of the iron at this boundary, they can determine the age of the magnetic field by understanding how the outer core is cooling. The diamond anvil cell simulated conditions comparable to those in the core by superheating the iron samples with a laser so they could be crushed between two pieces of diamond, putting them under immense pressure (Figure 2). The team used this process to create conditions representative of the interiors of planets from the size of Mercury to Earth. Their method revealed that the thermal conductivity of iron under these conditions ranged between 18 and 44 W/mK, which is much lower than previous models have suggested. This difference is highly significant, as a lower thermal conductivity means that the conditions to produce the magnetic field could have been around much longer than previously thought. With this thermal conductivity, the team determined that the field could be 3.4 billion years old. Highly motivated by this astonishing discovery, the team says that the next step will be to determine the thermal conductivity of other metals present in the core, and how they may influence the convection of the outer core. As interesting as these findings are, they are not universally accepted by the scientific community. Another study published at the same time, also in Nature, found the thermal conductivity of the iron core to be 90 W/mK. This team, from the Tokyo Institute of Technology, suggests that this value indicates that the field is only 700 million years old. No doubt there will be interesting debate and future research happening in regards to this subject! To read the full article from the DESY group, please click here. To learn more about the Earth’s core and the factors at play in producing the magnetic field, please click here.